The work of El Greco (1541-1614) is unmistakable. Often imitated but never duplicated, his work as a painter, sculptor and architect of the Spanish Renaissance is unparalleled, even in modern times. Though El Greco translates to “The Greek”, he spent the bulk of his life in Spain, specifically Toledo, where he moved in 1577. The original was painted on oil and is housed in the Museum of the El Prado in Madrid today. 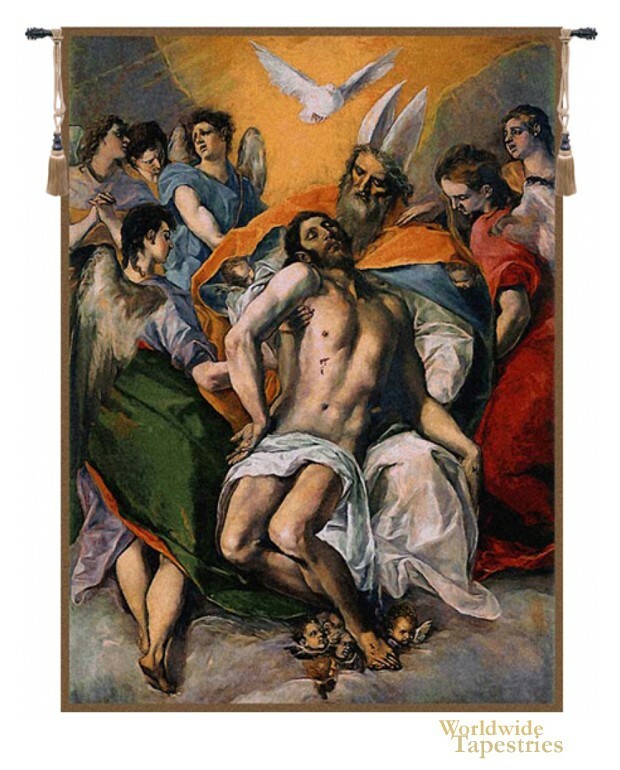 “El Greco’s Trinidad” shows the Father, in the presence of the Spirit Santo, returning to take the son he had sent to the humanity to die for their sins, home through the mystery of incarnation. The six angels who surround father and son share His pain as he reclaims his son and brings him home once again. This tapestry is lined and has a tunnel for easy hanging. Note: rod and tassels, where pictured, are not included in the price. Dimensions: W 37" x H 50"
Dimensions: W 100" x H 142"